I've been waiting and waiting for a cupcake shop to come to North Orange County. A few months ago I heard rumors of future cupcakes in Anaheim Hills. I patiently waited, but hadn't heard anything until yesterday. Reader Jojo informed me that Couture Cupcakes in Anaheim Hills is open! 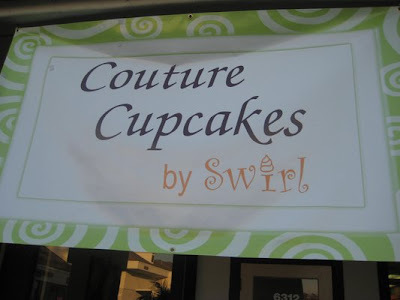 After doing a little research, found that Couture Cupcakes in located inside Swirl, a froyo shop at the corner of Santa Ana Canyon Road and Fairmont Blvd. Swirls cupcakes are called Couture Cupcakes, and they have a nice variety of flavors. They have Red Velvet, Carrot, Lemon Drop, Vanilla, Chocolate, Lemon Drop, Chocolate Peanut Butter and my all time favorite, Peanut Butter and Jelly (plus more). So far I have tried the Carrot, Red Velvet, Chocolate PB and The PB&J. The first three were decent, not the best CC's in the world but defiantly not the worst. Their cream cheese frosting was not as thick as I like and the cake itself was not very moist. Their PB&J was a winner in my book though. Even though the three times I have had it the cake was not all that moist, I really liked how the inside of the cake is loaded with grape jelly. Most PB&J cupcakes contain strawberry jelly, so I appreciated that they went in another direction. The PB frosting was good too and also topped with crushed peanuts. They also offer all their flavors in mini sizes. As far as the CC's go, they are about $2.75 a piece, which is the standard, but their minis are only a buck a piece, which is a steal. Even though I'm not expecting the best cupcakes ever, I still want to give these cupcakes a shot. Plus, I'm always up for good froyo. You know, Meringue Bake Shop Cupcakes http:meringuebakeshop.com has been in North Orange County, specifically Anaheim Hills (but caters to all of Orange County)for over a year. But I shouldn't have to remind YOU of that! ;) It probably just slipped your mind. Thanks for directing me to cup cakes near my house! I will have to score some! Can't wait for Cup Cake Classic this Summer, I'm excited to see how creative they will be! Shari- You are totally right! 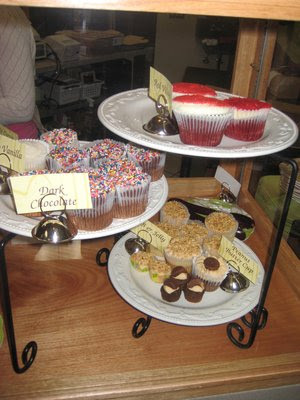 Meringue Bake Shop has some of the best cupcakes around, but she doesn't have a shop just yet. Thanks for reminding me.